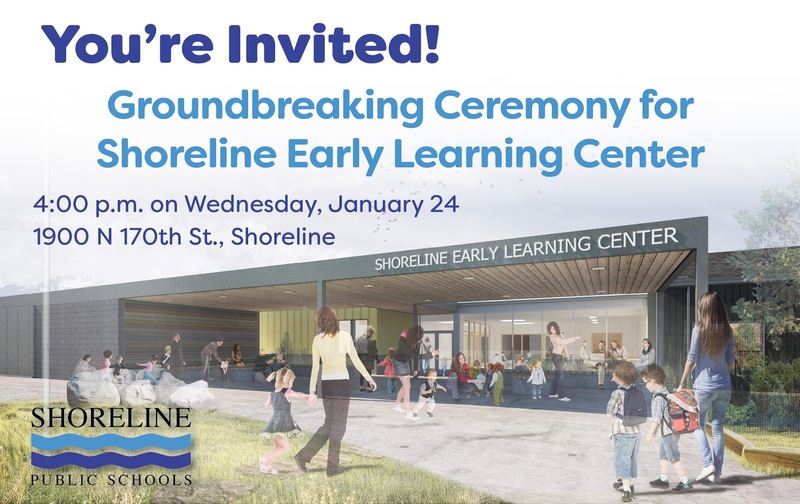 Shoreline Public Schools invites the community to attend a special groundbreaking ceremony to commemorate the beginning of construction on the Shoreline Early Learning Center on Wednesday, January 24 at 4 p.m. The event will be held at 1900 N 170th St., Shoreline (where the old Shoreline Children’s Center was located). There is no need to RSVP, but if you have any questions, contact the Schools' Public Information Office 206- 393-4412. The Shoreline Early Learning Center is one of four school construction projects being funded by a school construction bond approved by 73 percent of Shoreline School District voters in February 2017. The other projects to be funded by the bond include rebuilding Einstein and Kellogg Middle Schools and Parkwood Elementary.